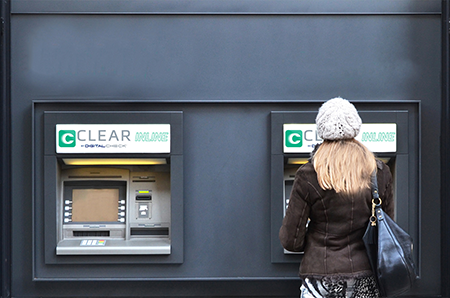 We started 2016 by rolling out a new product: Clear Inline®, an automated image-enhancement software system for ATMs and self-service stations. To understand why that’s important, let’s take a minute to look at what happens when you make a deposit at the ATM and how that affects the bank behind the scenes. Some banks and credit unions still take deposits by envelope at their ATMs, but that’s being phased out – not only because it’s less convenient for the customer, but also because it creates more work for the bank. Those envelopes still need to be opened, and any checks or money orders inside must be scanned to be sent on for clearing. Both of these tasks are usually done manually, which leads to additional handling costs, longer float times, and generally increased costs to the bank. So most new ATMs are equipped with built-in scanners: Feed a check or a dollar bill directly into the deposit slot, and the image is captured and submitted for clearing right away, no manual intervention or extra float time required. Right there is where the process diverges from that of older envelope-based ATMs – with an envelope deposit, once the customer inserts the envelope into the machine, he’s done. The transaction is finished, and nothing else happens until someone collects the envelopes (which may or may not happen on the same day, depending on the bank). With a direct-scanning ATM, it’s different: Once a check is inserted and scanned, the machine reads the magnetic characters and uses Optical Character Recognition (OCR) software to capture the account information and the handwritten dollar amount. This is the most important part of the entire process, because it means the customer doesn’t have to key in the dollar amount. That’s a nice boost for convenience, but more importantly, banks don’t want the customer keying in the dollar amount. People make mistakes, hit buttons twice without realizing it, and some may even try to cheat by deliberately adding an extra zero or two. All of those are issues that have to be corrected manually by a bank employee later. If the machine can read the amount on its own, and then present it to the customer as a yes/no question – “Amount is $200.00, is this correct?” – it takes away the biggest source of problems, which is human error. The problem is, OCR only works about 85% of the time on a good day. Why? Mostly because of poor handwriting, but sometimes due to faint printing, overlapping characters, or intense backgrounds that don’t scan well. When that happens, the bank still needs to clear that transaction, which leads to the customer keying in the dollar amount – AND still that image might (and often does) fail the clearing process. After all, OCR couldn’t read it the first time, but it was forced through anyway in the interest of completing the transaction, so there’s an excellent chance that whoever is on the receiving end won’t be able to read it either. Needless to say, fixing either of these involves a lot of manual work, and is very, very expensive. So that’s why Clear Inline is such a big deal for ATMs. It sits atop the ATM “software stack” and catches any images that can’t be recognized, cleans them up, and tries them again. More often than not, the enhanced image passes Image Quality Analysis, and since it’s all happening in real time, the customer doesn’t even notice. You might recall a similar software product by the name Clear by Digital Check®, which we introduced in late 2014. That system allows an operator to clean up images by clicking and dragging over areas on the check to lighten or darken them – usually after they’d already been “kicked out” of the main check processing workflow. Clear Inline removes the human element and automates the process by recognizing the most common problem documents automatically and making the necessary adjustments while the customer is still there. So, next time you’re at an ATM and the machine asks you if the dollar amount on your deposit is correct, take a second to think about everything that’s happening behind the scenes to make that possible. There’s a lot more going on than you think!